Vintage 1956 photo of Luigi Musso retired with Ferrari D50, Grand Prix Italy. 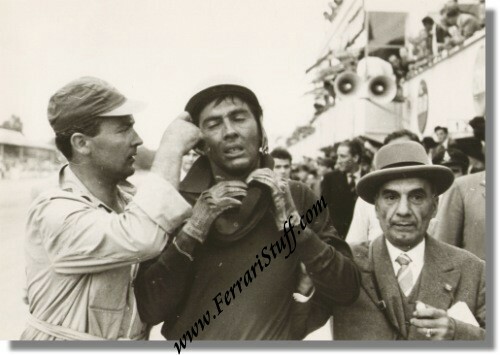 This is a vintage 1956 photo of an exhausted Luigino after he limbed out of his Ferrari Lancia D50 which he had to retire due to steering problems during the 1956 Italian Grand Prix at Monza. Luigi drove chassis number 0006, last of the Lancia produced D50's. The race was won by Stirling Moss on Maserati. The photo measures some 17 x 12 cm or 7 x 5 inches, is in mint condition.